Flo-Coat galvanized steel tubing is the original in-line galvanized product. It is manufactured using the advanced processing technique of in-line galvanizing first introduced by Allied in 1959. Over the years our Flo-Coat galvanized steel tubing product has benefitted from continuous advances in technologies and processes. Flo-coat galvanized tubing provides advanced levels of corrosion protection while having the ability to be painted or powder coated for aesthetic purposes with little advance preparation. In addition to its longevity, Allied’s cold forming process delivers higher strength levels than other competitive tubing products. Our galvanized steel tubing product typically carries a minimum 50ksi yield and 55ksi tensile strength for 15 gauge and heavier products. Learn about the Flo-Coat Galvanized Tubing Process! With such a wide-range of uses, Flo-Coat galvanized tubing must be versatile. Flo-Coat tubing is available in a variety of shapes sizes and wall thicknesses for use in the majority of mechanical and structural applications. 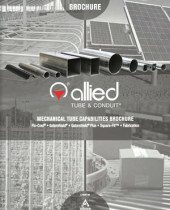 Allied’s signature process produces superior corrosion resistance by utilizing a triple layer of protection. First 99.99% pure zinc is applied followed by a conversion coating. Finishing the process is a clear organic topcoat that seals in the protection and produces a smooth, shiny appearance. We guarantee a minimum 50 ksi yield and 55 ksi tensile on many of our products with the ability to achieve higher properties with different steel chemistry. Compared with many alternatives that demonstrate a 30 ksi yield, Gatorshield demonstrates the unique ability to offer same strength in a lighter weight tube – up to 33% stronger! Flo-Coat tubing is capable of being fabricated using several different methods including hole punching, cutting, flattening, bending and more without the degradation of the coatings. All of these operations can be performed without cracking, flaking or otherwise damaging the integrity of the coating. Due to its 99% pure zinc coating; Flo-Coat can be easily welded. Contrary to popular belief, all galvanized products do not perform the same with regards to welding suitability. 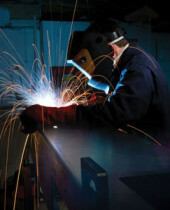 Weld performance is an important feature of Allied’s product line and one that has made it a success in several marketplaces for more than 55 years. There is nothing standard about our mill cut lengths. We produce the lengths that are required for your specific applications. Custom mill lengths from Allied allow you to minimize the scrap generated when having to cut standard lengths of pipe products.